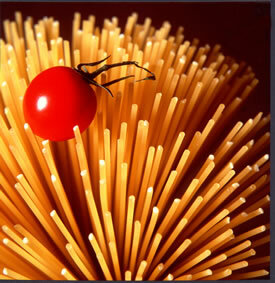 The first mention of using tomato goes back to the 17th century. It was imported into Spain by the conquistadores of the New World, and later spread throughout Europe, finding an ideal climate for cultivation in the Mediterranean countries. The Sienese botanist Pietro Andrea Mattioli was the first in Italy to call the tomato by the name it has retained ever since in Italian: pomo d'oro or golden apple. While Italians refer to it as a pomodoro, the French, English, Spanish and Germans continue to use terms directly derived from the name the Aztec Indians of Mexico gave it in Nahuatl language: tomatl.